28/5/2012 The Kastelliotika Nea website is as of now LIVE! 12/9/2011 Municipality of Dorida elected members at P.E.D. 1/4/2011 They stole 2 tons of meet from Gravia! 18/1/2011 Party at the Black Cat (Thursday 20, 2011)! 25/8/2010 What is happening yet again with the water at Kastellia? 9/2/2010 Kastelliotes Party at 18/03/2010! 8/11/2009 Kastellia outing on 11/11/2009 in Athens! 2/3/2009 Happy Sarakosti to everyone! 18/2/2009 NO MORE METAL MINES AT ITI MOUNTAIN! SIGN NOW! 22/12/2008 Merry Christmas and a Happy New Year! 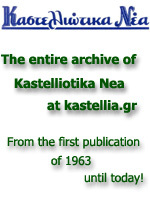 23/6/2008 The digitization of the entire Kastelliotika Nea archive is implemented and made available by kastellia.gr! 15/4/2008 Someone has been poisoning the village dogs! 23/2/2008 The water problem of our village finally solved! 13/12/2007 MERRY CHRISTMAS and A HAPPY NEW YEAR! 22/12/2006 MERRY CHRISTMAS and A HAPPY NEW YEAR! 14/10/2006 Find out where you vote! 12/10/2006 From now on kastellia.gr in English as well! 4/7/2006 Enjoy the summer! Visit our beautiful village of Kastellia! 20/8/2005 Huge success for our village youth feast!